HONG KONG (Reuters) - Fears over a slowdown in Chinese economic growth and the impact of the Sino-United States trade tensions are "receding a bit", the chief executive of London-based bank Standard Chartered, which makes the bulk of its revenue in Asia, said. Last month, the lender unveiled plans to double returns and dividends in three years by cutting $700 million (£530 million) in costs and boosting income, even though it missed its previous targets in tough market conditions. The 150-year-old group's latest plans, however, coincided with a risk of a slowdown in its core emerging markets due to the trade war as well as economic uncertainties in China and Britain, two of its main markets. 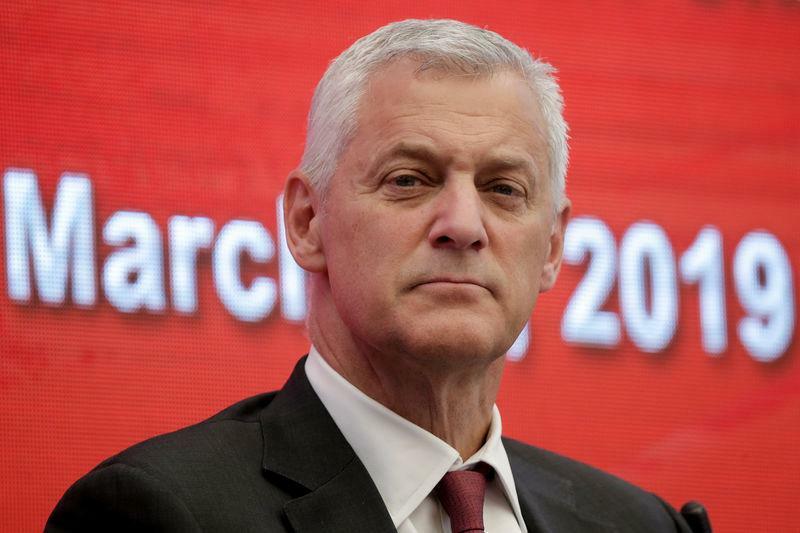 "We had plenty of concerns in the second half of last year looking at the market data in China - slowing growth and the impact of trade wars," StanChart CEO Bill Winters said on Tuesday at the Credit Suisse Asian Investment Conference in Hong Kong. "Those fears are receding a bit, partly because it looks like a deal is achievable and partly because China has taken relatively modest actions to re-stimulate its economy," he said. "We feel quite good about China." Global investors are closely watching Beijing's policy reaction as economic growth cools further from last year's 28-year low, amid months of intense negotiations between Washington and Beijing aimed at ending their trade dispute. Since July 2018, the United States has imposed duties on $250 billion worth of Chinese imports, including $50 billion in technology and industrial goods at 25 percent, and $200 billion of other products at 10 percent. China has hit back with tariffs on about $110 billion worth of U.S. goods, including soybeans and other commodities. The trade war between the world's two largest economies has raised costs, roiled financial markets and has also triggered analyst concerns about its impact on Asia-focused global banks that handle the bulk of the trade finance related businesses. Winters said StanChart's trade banking business had been under pressure with "severe" margin compression. StanChart has seen its fortunes slump as restructuring under Winters repaired a balance sheet hit by excessive lending in the previous decade, but left the bank struggling to lift profit. Under the new growth strategy, the Asia, Africa and Middle East-focused bank plans to bolster its investments in digital technology to accelerate its retail banking growth across its key markets. StanChart submitted in August last year an application for a licence to launch in Hong Kong an online-only retail bank, or virtual banks. The Hong Kong Monetary Authority is expected to award the licenses as soon as this month. Winters said StanChart was aiming to launch its Hong Kong virtual bank later this year, subject to regulatory approval. The bank, which launched its first African online-only bank in Ivory Coast last year, joins a wave of lenders seeking to use new technologies to reach customers and aims to expand its digital banking footprint in that region, he said. "Between the bank we have built in Africa and the bank we are building now in Hong Kong and the pure digital experience we are creating in India, we have got three things on the shelf," Winters said, referring to the retail banking business. "Can we end up being a disruptor in Indonesia using digital platforms either alone or in partnership with an e-commerce platform? Yes, we can. Will there be opportunities to launch a digital bank in China ...? Maybe."